Kegon (, or in some dialects, ) is the name of the Japanese transmission of the Huayan school of Chinese Buddhism, via the Korean Hwaeom tradition. Huayan studies were founded in Japan when, in 736, the scholar-priest Roben (良辯; originally a Hossō specialist) invited the Korean Simsang (審祥) to give lectures on the Avatamsaka Sutra at Konshu-ji (金鐘寺). 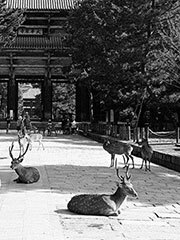 When the construction of Tōdaiji was completed, Rōben entered that temple to formally initiate Kegon as a field of study in Japanese Buddhism, and Kegon-shū would become known as one of the «six Nara (奈良) schools». Kegon thought was later be popularized in Japan by Myoe (明惠), who combined its doctrines with those of Vajrayana and Gyonen (凝然), who is most responsible for the establishment of the Tōdaiji lineage of Kegon.